A house divided was featured on a recent episode of a home improvement show of called Fix it and Finish It, hosted, of course, by soap star Antonio Sabato Jr.
Sure I’ve never heard of it, but given that almost all my time in front of the TV these days is spent watching stuff I got into because of some Auburn something popping up on there (Survivor, The Amazing Race, Finding Bigfoot), it’ll probably be my new favorite show. 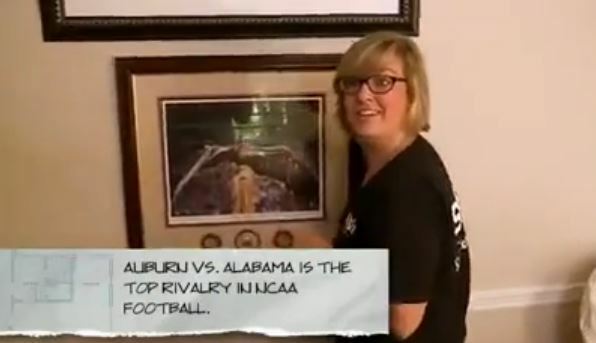 “Who went to Auburn?” the interior designer asks as she hangs a picture of Auburn’s War Eagle. “I did,” the husband, whose wife went to Alabama, responds. “Roll Tide,” the wife says. Related: VIDEO: Auburn showcased in episode of HGTV’s ‘House Hunters’.